I first saw One-Eyed Jacks (1961) sometime in the late ’60s or early ’70s on a small black-and-white television. Pan-and-scanned of course. And for some reason it really stuck with me. I would have been in my mid to late teens and no doubt didn’t get a lot of the film’s themes and psychological undercurrents. But I knew enough to know that this wasn’t much like the westerns I was familiar with, particularly in its unusual setting (coastal Monterey) and the seemingly mythic dimensions of the central conflict. I would watch it whenever it came up on the schedule, but probably didn’t see it in colour until a couple of decades later – that would have been on a pan-and-scanned VHS tape. Which means that I never really saw the movie until about four years ago when I acquired a Blu-ray (released by Savoy Films/Intergroove Movies), made in Germany from a French print – the titles are French, and the soundtrack defaults to a German dub. The image quality is not very good, but at least I could finally see the widescreen image, get a better sense of the film’s visual composition. All of which confirmed the qualities which distinguish it within and from the genre. 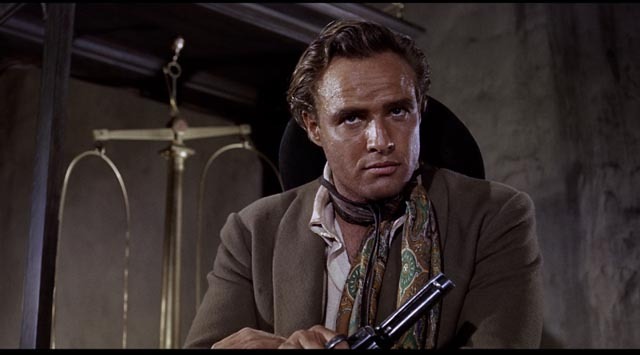 So – for more than four decades One-Eyed Jacks has been not simply one of my favourite westerns, but one of my favourite films, period. Which is why I was elated when Criterion announced their impending release of the film, fully restored, on Blu-ray. As others have pointed out, this is not quite exactly as first released – that is, the original Paramount logo has been replaced with a new Universal logo at the beginning, and the closing logo has been dropped in favour of a text card about the restoration, which appears before the final music cue fades. This last is a little irritating because it abruptly kicks you out of the movie while you’re still absorbing the final dramatic moment. Hard to know what those in charge think they’re doing in cases like this. What’s more important, the emotional play of the movie or making sure the viewer gets to see who did the technical work? But apart from this minor quibble, the disk is a revelation. The transfer was made from a combination of the original VistaVision negative and a separation master, and the colours and clarity completely obliterate decades of weak public domain ghosts. The film looks and sounds fantastic on the disk; the wide vistas and looming closeups prefigure Leone’s style by several years, and the sound is subtle and detailed, capturing desert winds and crashing surf to create a textured atmosphere punctuated by bursts of gunfire, the rhythm of horse’s hooves, the harsh crack of a horsewhip. Dialogue scenes are tense and intimate. 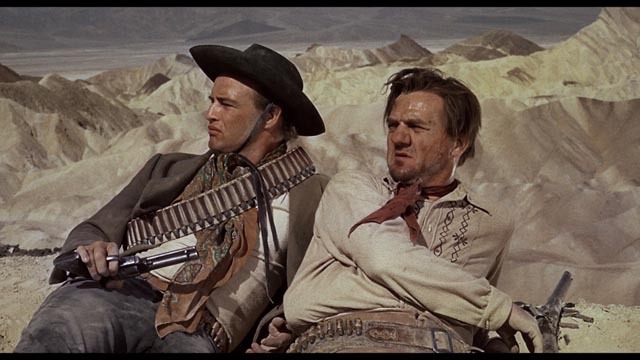 In fact, the soundscape is so effective that you realize more clearly than ever that the weakest element of the film is Hugo Friedhofer’s score, which layers on standard western tropes which partially obscure the ways in which the film works against genre cliches. From the opening shot – Brando sitting on a long wooden counter casually eating bananas, a six-gun resting loosely in his hand on his lap – the actor-director dominates the movie. This is the first, and most important, disruption of the genre: Brando, with his huge Method persona, stands against the image of such earlier stars as Gary Cooper, Jimmy Stewart, Joel McCrea. In scale, he’s closer to the mythic quality of John Wayne, but he’s more modern, more internal. 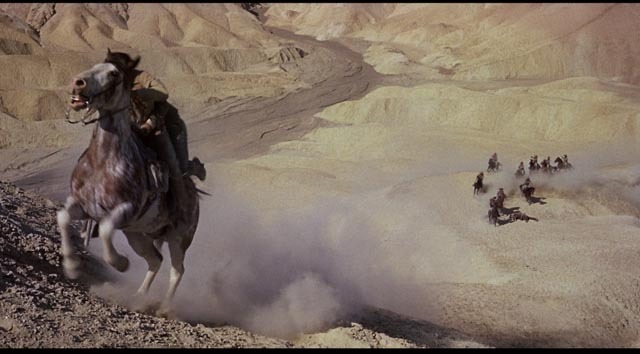 As the film presages the spaghetti westerns, Brando points forward towards William Holden’s Pike Bishop. This is a character who bridges the divide between tradition and revisionism; he still carries a discernible romanticism even as the film begins to deconstruct the qualities of that romanticism. 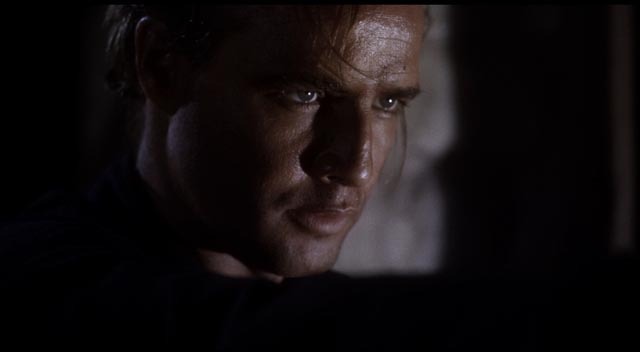 In broad terms, One-Eyed Jacks is a familiar story of betrayal and revenge. Following the opening bank robbery, Brando’s Rio is left to his fate by his partner and mentor Dad Longworth (Karl Malden); escaping from a brutal Mexican prison five years later, Rio is obsessed with finding Dad and wreaking revenge. He finally finds his old partner in Monterey, now settled in respectably as the local sheriff, with a wife and stepdaughter. Rio and his new unsavoury gang are planning to rob the local bank during the annual festival when its vault will be overflowing. But Rio’s personal motives delay the robbery … and the film settles in to wait, with internal and interpersonal conflicts suppressing the action the plot has been promising. Despite the magnificent locations, the story is caught claustrophobically deep inside Rio’s psychological confusions. Knowing that Dad betrayed him, biding his time as Dad lies about what happened (not knowing that Rio knows exactly how he was betrayed), Rio embarks on what may be the nastiest way to get his revenge: he sets out to seduce Louisa (Pina Pellicer), Dad’s young stepdaughter. Having succeeded, he feels no satisfaction. His sense of guilt now meshes with Dad’s guilt, the combination forming a perfect storm of sadomasochistic conflict. Rio internalizes his guilt, seeking punishment, while Dad externalizes his in savage violence intended to destroy the object which provokes those feelings of guilt. But even here things are not simple; Dad doesn’t carry out his violence to its obvious end, leaving room for his own final punishment. This amounts to a development of the psychological westerns of Anthony Mann, Budd Boetticher and others into a more modern idiom, a blend of Freud and classical tragedy. Although the film is focused more on inaction than action, it’s beautifully paced, its quieter moments imbued with tension which is periodically released in bursts of psychological and physical violence. Brando the director obviously cares deeply for his fellow actors and every role, no matter how small, is invested with depth and complexity, allowing familiar genre performers room to flesh out what in lesser hands could easily have devolved into stereotype. 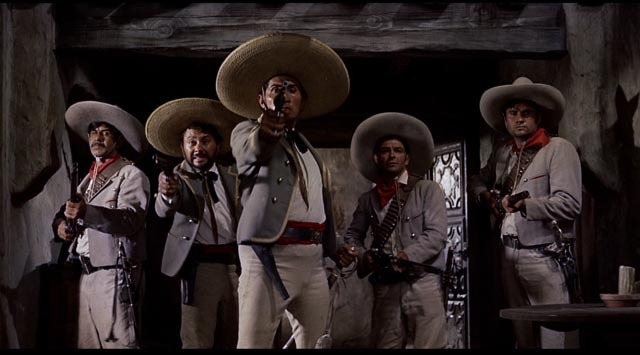 Slim Pickens as the unpleasant deputy Lon who resents Rio as an interloper interfering with his plans to marry Louisa; Ben Johnson as Bob Amory, the seedy outlaw who leads Rio to Monterey and chafes increasingly at the delays in the gang’s plans; Sam Gilman as Bob’s impatient sidekick, Harvey Johnson. Katy Jurado as Dad’s wife Maria and Pina Pellicer as Louisa provide a much stronger female counterweight to the emotionally stunted men than is usually found in westerns. 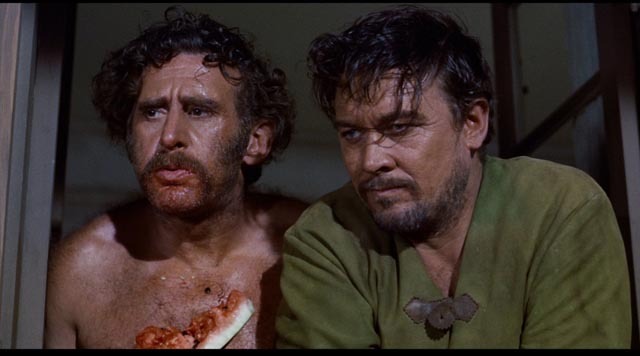 There is excellent support from Larry Duran as Rio’s partner Chico, bound to him in friendship since their escape from prison, whose harsh fate provides the film with one of its most powerful sequences. Elisha Cook Jr and Timothy Carey also turn up in small but significant parts. As this cast list indicates, the film also has strong connections with the work of both Stanley Kubrick and Sam Peckinpah. This isn’t surprising given the convoluted history of the production. 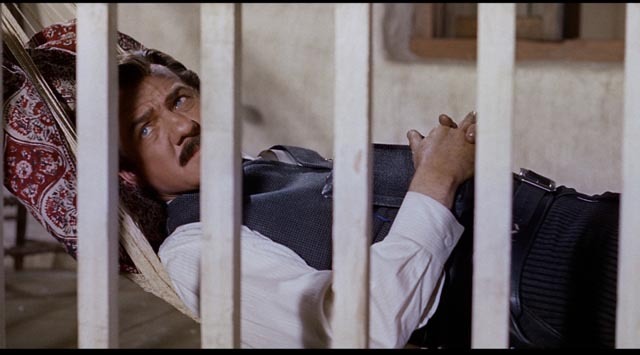 Peckinpah wrote the original script, adapting Charles Neider’s novel The Authentic Death of Hendry Jones, which in turn was based on the story of Billy the Kid and Pat Garrett. Kubrick was eventually brought on as director, but scrapped Peckinpah’s script, hiring Calder Willingham, who had written the script for Paths of Glory (1957). The script was further reworked by Guy Trosper with Brando, and Brando encouraged improvisation during the shoot after he took over from Kubrick. Peckinpah, of course, returned to the story in the early ’70s when he made Pat Garrett & Billy the Kid, a production as troubled as Brando’s. That production trouble could be attributed to some degree to Brando assuming the director’s role. That he did so on a western seems incongruous; his rebellious, eroticized persona from movies like The Wild One and A Streetcar Named Desire seems indelibly a part of the modern world, not the mythic past of the western. And yet paradoxically, it’s that persona which gives this particular western its dramatic and thematic weight, prising the narrative out of the familiar mythic past and imbuing the characters and story with an immediacy which Peckinpah eventually built on in The Wild Bunch and Pat Garrett & Billy the Kid. The western myth of white hats and black hats and primal struggles on the frontier had been rendered safe by distance – another time and another place, a dream partially rooted in history, but safely contained as an idea of rugged individualism and independence which provided a temporary escape from the constraints of modern society. Brando here begins the work of dismantling that illusion by connecting the violence and psychological flaws underlying the myth with a more modern idea of character and behaviour; the western myth (as many an elegiac late western shows) was irrevocably opposed to the idea of a society dependent on mutual responsibilities. Someone like Peckinpah lamented this truth; but Brando seems more ambivalent as his story plays out in slow-motion, ultimately depriving the audience of the satisfaction of catharsis, while leaving us with a fragile and ill-defined idea of some future stability for Rio and Louisa. In his direction, Brando took an exploratory approach to the material, searching for the story’s meanings as he shot. This was why the budget ballooned from $1.8 million to $6 million; why he shot a million feet of film and initially turned in a five-and-half-hour cut. Not surprisingly, the producers took control in the later stages of post-production, Re-shoots were mandated and the footage was drastically edited down. What seems remarkable is just how well-shaped and coherent the final film is; this is surely a tribute to Brando’s raw skills, his ability to find in all that improvisation a psychological core which was capable of withstanding the producers’ revisions. This story offers yet another tantalizing fantasy, perhaps comparable to the discovery of a copy of Welles’ original cut of The Magnificent Ambersons. Some of the changes imposed by the producers are referred to in the disk’s supplements, one in particular standing out: when Rio tracks Dad down at his house by the sea in Monterey, Dad is prepared for a violent confrontation, fully expecting Rio to be looking for revenge. But Rio remains friendly, allowing Dad to weave an elaborate lie; Rio, knowing this is a lie, lets Dad believe that he’s gotten away with his betrayal. He remains plagued by his guilt, however, wants Rio gone. Rio, through his seduction of Louisa, plays into Dad’s own need, making it possible for the hypocrite to act out with self-righteous violence. However, apparently in the original version, Dad confesses fully to his betrayal. This is an interesting idea, but it’s hard to see how the rest of the film could play out from this. Would Dad’s “honesty” have made Rio’s attempt to destroy him through ruining Louisa a more vicious act? Dad’s hypocrisy in the existing version in a sense provides Rio with his justification for targeting Louisa, an act which Rio immediately regrets because he recognizes her innate decency, which sets her apart from Dad whose apparent decency in the community is a lie. I would disagree that the change in that reunion scene between Rio and Dad makes Dad nothing more than a purely bad character; in Malden’s rendering of the character there is still a great deal of nuance; he has been accepted by the community despite openly admitting his outlaw past, a bad man reformed, now contributing to the peaceful health of the town. 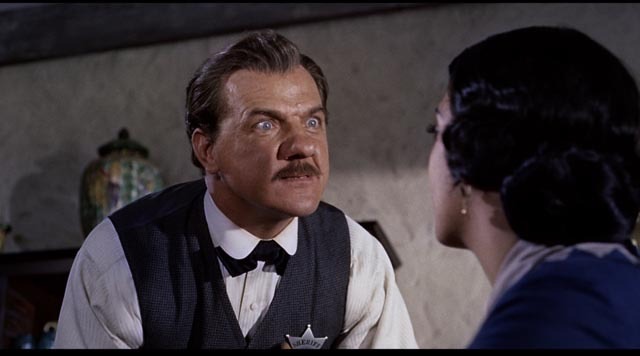 The fact that even this image is a self-serving construct calls into question the idea of what constitutes social decency, a question further elaborated in the repulsive character of Deputy Lon, who uses his position as a representative of the law to impose himself on Louisa and abuse Rio when he’s at his most vulnerable. Rio himself is a deeply compromised character whose actions can’t be condoned, whose image as the romantic outsider conceals a risk to orderly society which makes the ostensibly “happy” ending highly problematic. The tension between this image of the individual and the responsibilities of the society within which he exists and against which he stands is at the core of the American identity, which even now continues to complicate a society which so often willfully refuses to acknowledge the mutual interdependence which is essential to any coherent civilization. 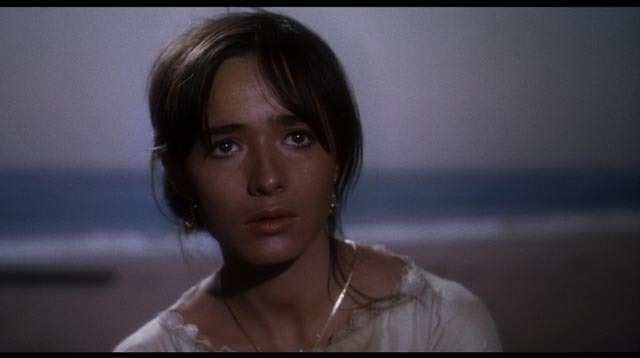 As already mentioned, One-Eyed Jacks looks spectacular on Criterion’s Blu-ray. The negative and separation master were scanned at 6K, with the restoration done at 4K. The colours are rich and vibrant, with a strong level of detail; the clarity of the image makes the occasional use of back projection quite noticeable, but so much of the film was shot on location that these moments are not too distracting. The mono sound is strong, with a great deal of depth. There are four main supplements: a brief introduction to the restoration recorded this year by Martin Scorsese for a screening at Cannes (2:55); a video essay about the production by Toby Roan (23:09) and a video analysis by David Cairns (24:02), who asserts that the rear-projection shots indicate the producer-mandated revisions, although the technique was still quite standard at the time to provide a more controlled environment for dialogue recording which in this case would have been complicated by the locations by the sea; and finally audio excerpts from Brando’s self-recorded script notes (33:38) in which he mulls over individual scenes, searching for the focus and meaning of individual moments. There’s also a long, awkward trailer (4:44) which shows all the signs of a distributor struggling to figure out just what the heck they had on their hands. 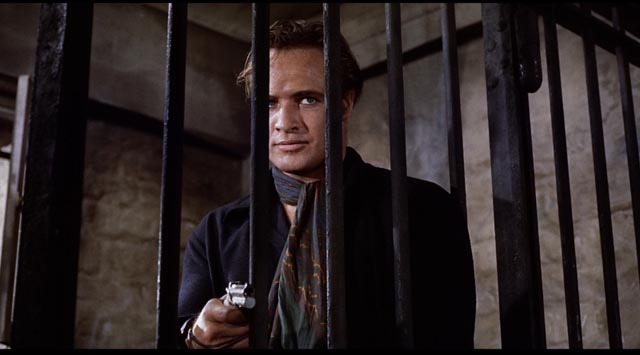 Howard Hampton’s booklet essay, though rather over-heated, does a good job of describing the film’s very distinctive qualities as a critique of the western myth and how this is closely tied into Brando’s persona as actor and director. It no doubt seems churlish to offer a complaint here given the quality of the disk, but I would have loved to hear a commentary track by Paul Seydor, whose book The Authentic Death and Afterlife of Pat Garrett & Billy the Kid includes a wealth of detail on Neider’s source novel and Peckinpah’s adaptation, as well as the actual history on which the novel was based. This entry was posted in Review and tagged Actors, Blu-Ray, Criterion, Directors, Restored Films, Western. Bookmark the permalink.